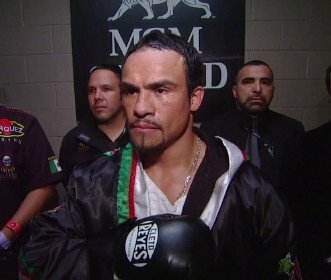 By Rob Smith: 39-year-old Juan Manuel Marquez still doesn’t know if he’ll return to the ring in 2013, as he’s considering whether to continue to fight or not, according to notifight.com. He’s still talking with his family about whether he should come back and perhaps fight one or two more times before hanging up the gloves permanently. It’s going to be difficult for Marquez to retire right now with the lure of a fifth fight with Manny Pacquiao at the Cowboys Stadium this year. Pacquiao’s promoter Bob Arum hasn’t yet talked to Marquez about his future plans, but you can guess that he’ll make a huge offer to get Marquez to continue fighting so that he can set up a Pacquiao vs. Marquez fifth fight this year. It might actually be better Pacquiao’s sake if he doesn’t try and get Marquez to continue fighting because Pacquiao really doesn’t need another knockout loss like the one he suffered on December 8th of last month when Marquez knocked Pacquiao completely out in the 6th round. That was a knockout that could have some lasting negative effects for Pacquiao for the remainder of his career. Arum could be making a mistake of having Pacquiao fight Marquez again, because even if it makes a ton of money for Pacquiao, Arum and Marquez, it could be the last big payday for Pacquiao if he gets knocked cold again. You would have to figure that Pacquiao would have a lot of pressure on him to retire after getting knocked out a second time. Arum should think about the dangers involved for Manny if he puts him back in with the guy that just flattened him. Arum thinks that everything will be okay if he gets Pacquiao checked out at a brain clinic and then have him rest until September before he fights again. That sounds good but it might not be enough. When you get flattened like Pacquiao did, he might need more time than just 9 months of rest. He might need a good long rest before he can fight again and putting him back in the ring with Marquez is kind of a scary situation. Previous boxing news: Is Pacquiao losing now because he’s not training hard enough?